David Grabin (Grabinski) was born the rural town of Slesin in western Poland not far from the border with Germany. He grew to be a short and stocky young man, accustomed to hard labor in the family's grain business. The youngest of 7 children, he did his part in the family business from the age of 14. He was a profoundly observant Jew, having studied Torah from a young age. In the summer of 1940, his family was taken from their hometown, and David began a grueling forced journey across Eastern Europe. He spent time in more than fifteen camps before he was liberated in Theresienstadt, Czechoslovakia, on the very day that the camp was scheduled for liquidation. Only his brother survived the war; he never saw the rest of his family again. 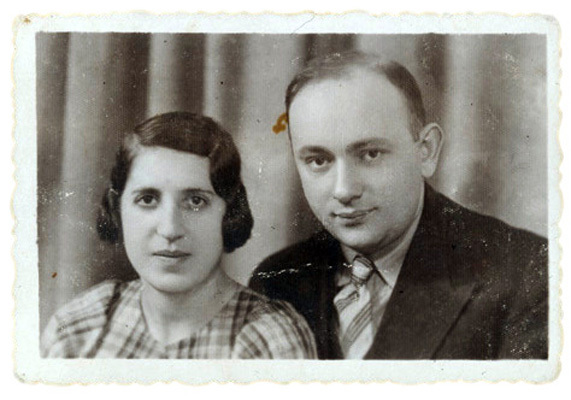 Batya Berendt, David's first cousin on his mother Michla's (née Szattan), and her husband; Konin, Poland, 1936.